From the backwaters and the backwoods of Mississippi and Tennessee comes the soul-tinged country sound of Jamie Davis & Soul Gravy Band. Town to town and song to song, this band of musicians travels the roads from Natchez to Nashville entertaining crowds with original music and a Rock & Roll show. Jamie Davis met Dan Isbell at Northeast Mississippi Community College while both were attending on country music scholarships and performing in the on-campus band Campus Country. When Davis and Isbell transferred to Mississippi State University they began playing in local bars to help pay their living expenses while attending college. The band now consists of Davis and Isbell, along with Jerry Carnathan, Lee Graham and John Staggers. These guys blend together smooth vocals, burning guitar tones, and downright funky rhythm to create a unique Southern sound that is all their own. 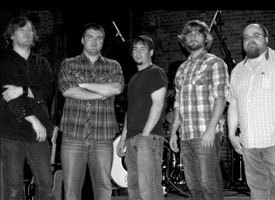 Within the past year Soul Gravy has shared the stage with artists such as Dierks Bentley, Hank Jr., Jason Michael Carroll, Night Ranger, One Republic, the Gin Blossoms, Louisiana's Le Roux, Jonathan Singleton & the Grove, and recently traveled with Josh Thompson and Eric Church on several dates as the opener for the Jagermeister Country Tour. The band has had the honor of playing such venues as the world famous Wildhorse Saloon and 3rd & Lindsley in Nashville, TN, the BancorpSouth Arena in Tupelo, MS, and regularly performs at Rick's Cafe in Starkville, MS.
We play music because it is what we love to do and I hope it shows when people listen to our music." OMG ! The best ever !!! The band was a HUGE hit! Probably best part of the entire weekend (J ) !! Keep us updated as they play in locations near and around MS…. We want to go see them !!! For booking information on The Jamie Davis & Soul Gravy Band or to book or hire this band for your wedding reception, college event, corporate function or concert, click on the Request Booking Information tab below.